VIDEO: “Switzerland: Parliament forced to debate basic income for nationals” Ruptly TV, Oct 3, 2013: Enno Schmidt, founder of Generation Basic Income Initiative, talks through the aims of the unconditional basic income initiative. Max Rivlin-Nadler, “Swiss to Vote on Guaranteed $2800 Monthly Income for All Adults,” Gawker, October 5, 2013. Common Dreams staff, “Swiss Showing the World How to Take on Pay Inequality” Common Dreams, Saturday, October 5, 2013. This story includes photos and embedded video. 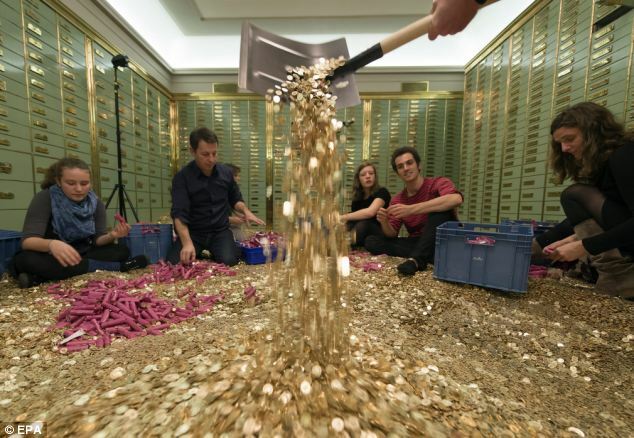 Anna Edwards, “Streets of Basel paved with gold: 15 TONS of five cent coins are dumped on city’s streets as protesters demand a basic minimum income for every Swiss household,” The Mail Online, 4 October 2013. 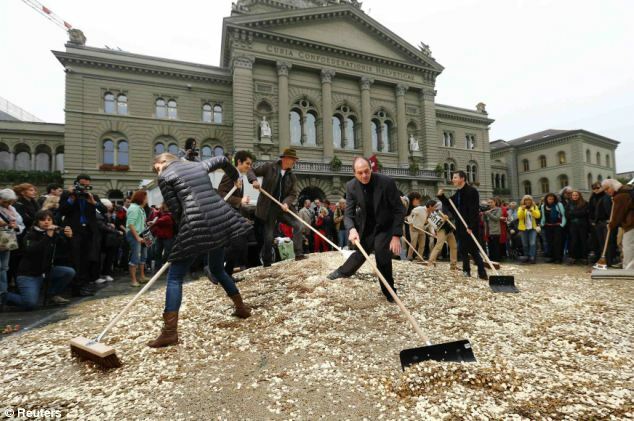 This story includes pictures of how the coins were assembled to be dropped during the demonstration in Bern. Jameson, “Swiss to Vote on Whether to Give a $2,800 Monthly Income to Every Citizen,” ClassWarfareExists.com, 5 Oct 2013. VIDEO: “Swiss prepare to vote on basic income,” Belfast Telegraph. Richard Cook, “Swiss in Forefront With Basic Income Proposal,” Global Research, 6 October 2013. AUDIO: Aaron Schachter [Interview with Karl Widerquist], “$2750 a month for every adult, guaranteed? Switzerland’s considering it,” PRI’s The World, Producer: Emily Files, October 14, 2013. VIDEO: Rubin Report, “Switzerland Might Guarantee A $2800 Monthly Income for All Adults,” The Rubin Report, Oct 14, 2013. Adam Taylor, “Switzerland Mulls Giving Every Citizen $2,800 a Month,” Business Insider, Slate, Oct. 19 2013. Ivan Botoucharov, “The Abolition of Poverty in Switzerland: A Template for Europe? The success of a ‘Basic Income’ campaign in Switzerland provides momentum to an equivalent EU initiative.” One: Society, Democracy, Europe, 04 Oct 2013. Josh Eidelson, “Rather than savage cuts, Switzerland considers ‘Star Trek’ economics: Switzerland will vote on giving every adult in the country a $2,800 check every month. How would that work?” Salon.com. Friday, Oct 11, 2013. If you know of more articles on the BI referendum in Switzerland, please leave the publication information and link in the comments section. If it’s in a language other than English, please indicate what language it’s in.